The culture is also known under the names of Linear Band Ware, Linear Ware, Linear Ceramics or Incised Ware culture. It is commonly abbreviated as LBK, from the German Linearbandkeramik. 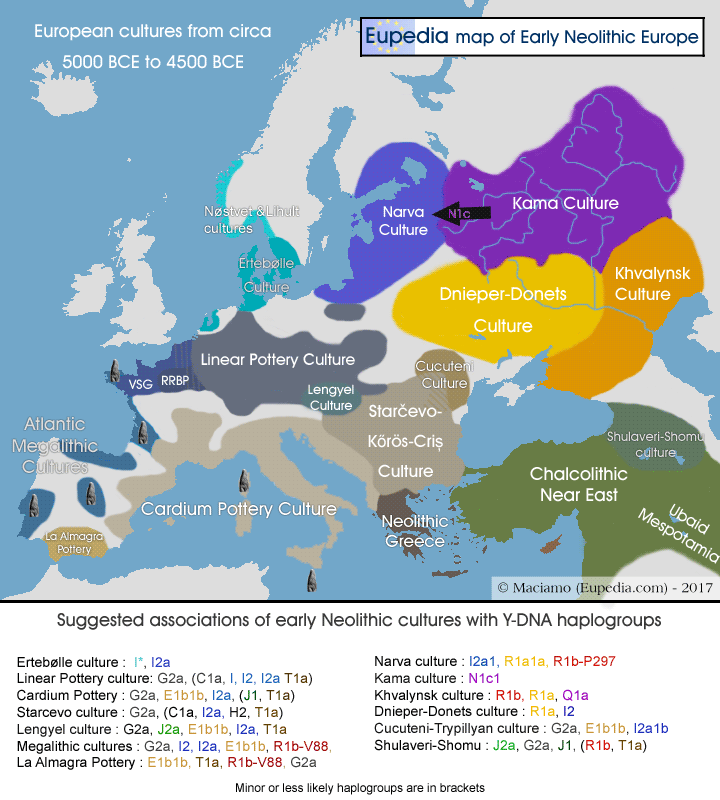 Represents the advance of Early Neolithic farmers from the Starčevo-Körös culture across central Europe, starting from what is now Hungary and spreading north to the Czech Republic and Poland, west across Germany to Belgium and northern France, and east to western Ukraine, northern Moldova and north-eastern Romania. Their Neolithic agricultural economy was based primarily on the cultivation of crops from the Fertile Crescent, such as Emmer wheat, Einkorn wheat, peas and lentils, and to a lower extent barley, millet, rye, and broad beans. The LBK people settled on fluvial terraces and in the proximities of rivers, especially in regions rich in fertile loess. Stockbreeding was also practised, of cattle in particular, but also of goats and pigs. The LBK farmers supplemented their diets by hunting deer and wild boar in the open forests. People lived in trapezoidal or rectangular wooden longhouses built with massive timber posts. They had thatched roofs and were chinked with wattle and daub mortar. The longhouses measured from 7 to 45 meters in length and 5 to 7 meters in width. Villages were composed of five to eight longhouses, about 20 metres apart. Some villages were fortified for some time with a palisade and outer ditch. Flint and obsidian were the main materials used for points and cutting edges. LBK farmers harvested with sickles manufactured by inserting flint blades into the inside of curved pieces of wood. Trees were felled and carved using shoe-last celt, which consists of a ground stone chisel blade tied to a handle. Like other early Neolithic cultures in Europe, the Linear Pottery featured burials of women and children under the floors of personal residences - a practice that continued until 4000 BCE. Cemeteries containing from 20 to 200 graves make their appearance from 5000 BCE and included both male and female skeletons, apparently arranged in groups based on kinship. Both cremation and inhumation were practiced. The inhumed were placed in a flexed position in pits lined with stones, plaster, or clay. Graves typically contained goods like flint implements or jewelry of Spondylus shells, but pottery was found almost exclusively in female graves. The fast expansion of the LBK culture did not leave much time for Near Eastern farmers to intermingle with Mesolithic European hunter-gatherers - a fact now confirmed by the analysis of several LBK genomes that show only about 5 to 10% of indigenous European admixture. However, Mesolithic Europeans continued to live side by side with LBK farmers and progressively interbred with them during the later Rössen (4600-4300 BCE) and Schöningen (4200-3950 BCE) periods. The only exception is northern France, where the LBK-derived RRBP (French acronym standing for Recent Linear Pottery of the Parisian Basin) immediately shows high levels of indigenous European admixture. LBK people had an average body height of 166.6 cm for men (ranging from 156.5 to 175.5 cm) and 158 cm for women, considerably shorter than Mesolithic Europeans of the same period. Ancient DNA tests have shown that LBK people had fair skin, brown eyes and dark hair, while Mesolithic Europeans had darker skin, dark hair, but blue eyes. Both groups were lactose intolerant. The following mtDNA samples were tested by Adler (2012), Zvelebil and Pettitt (2012), Lazaridis et al. (2013), Brandt et al. (2013), Brotherton et al. (2013), Gamba et al. (2014), Szécsényi-Nagy (2014), Haak et al. (2015), Rivolat et al. (2015), and Mathieson et al. (2015). 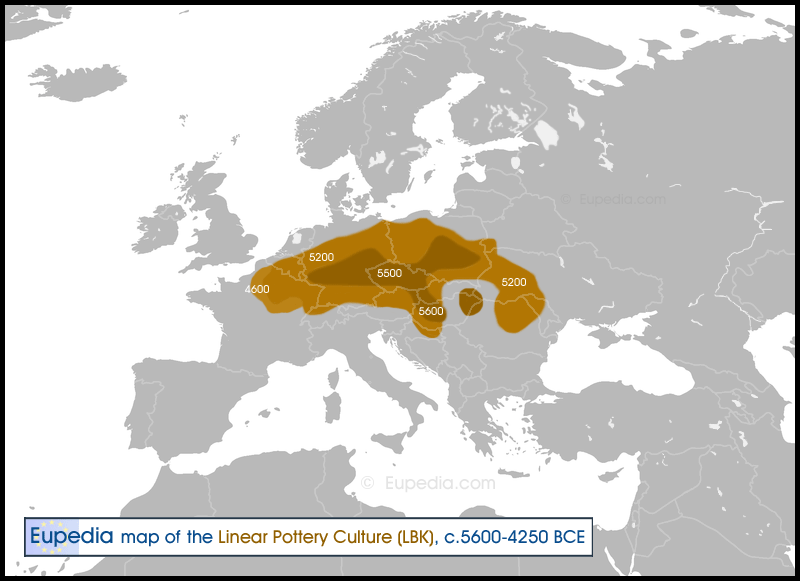 * includes Alföld Linear Pottery Culture, Early Neolithic Alsace and unspecified Middle Neolithic Germany.